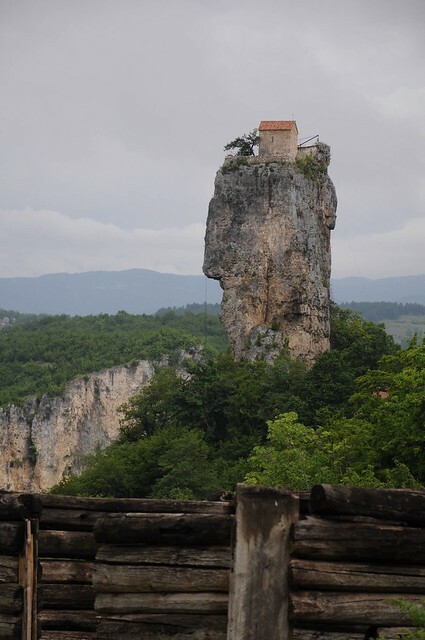 The Katskhi Pillar (aka Katskhi Column) - a 40 metres (130 ft) tall limestone monolith in the village of Katskhi, Imereti, Georgia, lays its claim to the fame because of a small church which sits atop it. The rock has been venerated by locals even before the arrival of the Christianity in the region. 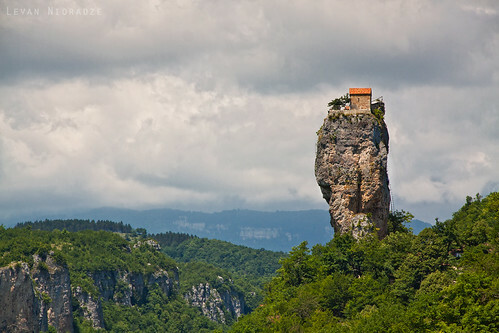 Reportedly pagans built the temple at this unusual location as to them the pillar was symbol of fertility. 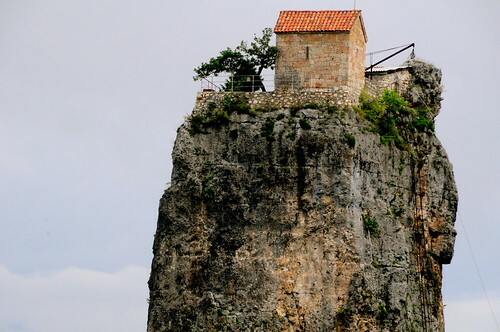 The earliest recorded climb to the top was in 1944 when the climbers found in the ruins of the stylite church, a crypt and 600-year-old bones of a hermit who probably was the last stylite who lived there. Stylites meaning "pillar dweller" is derived from Greek word stylos (pillar) and is used for Christian ascetics who live on pillars, preaching, fasting and praying. Stylites were common in the early days of the Byzantine Empire and the first stylite was probably Simeon Stylites, the Elder, who climbed a pillar in Syria in 423 and remained there until his death 37 years later. 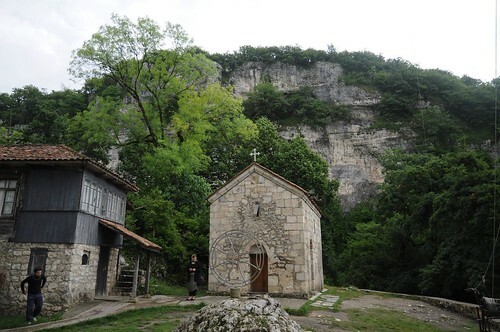 The original church which was built circa 5th or 6th century, was restored from 2005 to 2009, however Maxime Qavtaradze a 59-year-old monk climbed the Rock in 1995 and restarted religious activities there. The current Church is dedicated to St. Maximus, the Confessor. The top of the Pillar measures 150 Sq. Metres (1615 Sq. ft.) and besides the Church it consists of a crypt (burial vault), three hermit cells, a wine cellar, and a curtain wall on the uneven top surface of the column. At the bottom of the pillar is a recently built chapel named after St. Simeon. Maxime Qavtaradze lives mostly on the top and his necessities including meals are sent up to him by his friends/devotees by means of a winch. The monk comes down, twice a week, using a steel ladder, to counsel persons who come to the St. Simeon Chapel seeking guidance from him for their troubles. 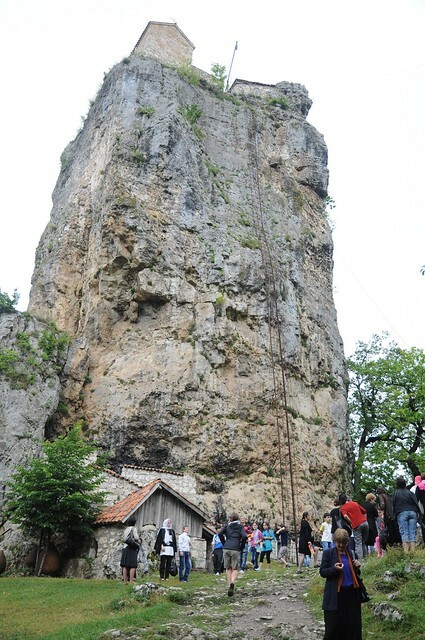 It takes him about 20 minutes to climb up again and reportedly he has said that when he is too old/frail to use the ladder, he will remain at the top until his death.